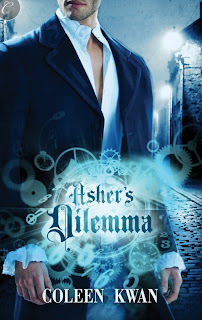 My second steampunk romance, Asher's Dilemma, has just been released. This book is a sort-of sequel to Asher's Invention but can be read as a stand-alone book. The story involves time travel, steampunk gadgets, and a bitter sweet love triangle. Asher knows that something in the near future causes Minerva Lambkin, the woman who turned down his marriage proposal, to be erased from existence. And he’s sure it has something to do with his device. Alone in a familiar world where he doesn’t belong, he’ll have to find a way to destroy the time machine to save the woman he loves from extinction. Even if that means erasing his own future. I love time-travel romance! I was introduce to Steampunk romance by Mary Wine and just loved it. It's seems it is not an easy task to write steampunk. I would love to read Asher's story. Did you researched and did you enjoy writing this book. OMG~! This book sounds amazing! Going on my TBR list~I can't wait to read it. Thanks for the well wishes, Nicole, kipha, and Mae. Congratulations on the release, Coleen! Sounds good and lovely cover!